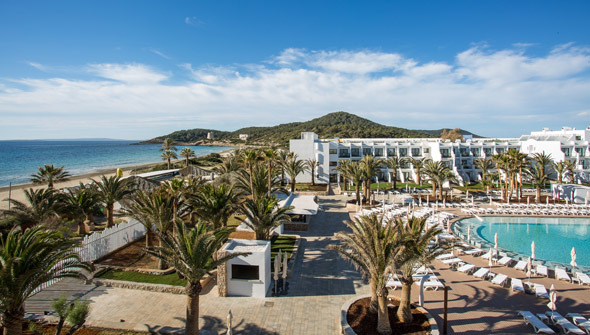 Interval International has announced the affiliation of Grand Palladium White Island Resort & Spa in Ibiza, Spain. This third-largest of the Balearic Islands is famous for its Mediterranean beaches and sizzling nightlife. Three of the Palladium Hotel Group’s other properties joined Interval’s global network last year: The Royal Suites Yucatán by Palladium and The Royal Suites Punta de Mita by Palladium in Mexico and The Royal Suites Turquesa by Palladium in the Dominican Republic. Situated on a mile-long beach on the southern side of the island, Grand Palladium White Island includes 430 well-appointed units overlooking turquoise waters and landscaped gardens. Each features a chic, contemporary decor with colorful accents, elegant modern furnishings, balconies or patios, iPod dock stations, satellite TV, and complimentary Wi-Fi. Among the on-site amenities are a restaurant, outdoor fresh-water swimming pool, children’s pool, kids’ club and activities program, playground, tennis courts, numerous water sports, concierge, butler service, and 24-hour room service. At the adjacent Grand Palladium Palace Ibiza Resort & Spa, guests will have access to five additional restaurants and the Zentropia Palladium Spa & Wellness Center, which includes a fully equipped gymnasium and water circuit with a heated pool, hot tub, sauna, and Turkish bath. Forty-nine miles (79 kilometers) off the east coast of mainland Spain, Ibiza is 225 square miles long (585 square kilometers) and is internationally popular for its beautiful shoreline with picturesque beaches, vibrant nightclubs, fine restaurants, and bustling markets. Visitors can explore Ibiza’s historic old town, a UNESCO World Heritage Site; Ibiza Cathedral and Castle; and the archeological museum. Other local attractions include Las Salinas Natural Park, one of the main natural reserves on the islands; Aguamar Water Park; Aquarium Cap Blanch; and the Faro de Botafoc.